Fads come and go and then return once more; sometimes, a fad becomes a mainstay and an accepted part of one’s culture. Perhaps this will be the case with the ever so interesting Japanese onigirazu. Onigirazu is a type of Japanese rice ball or onigiri (sometimes also referred to as musubi or musubi), but rather than a traditionally shaped ball or a triangle, onigirazu is shaped into a flat rectangle, almost like a sandwich. Onigirazu is wrapped on the outside with seaweed, just like a traditional onigiri, and includes rice with various fillings as well. Onigirazu fillings are less traditional than that of onigiri and can be likened to Japanese-style sandwich fillings. 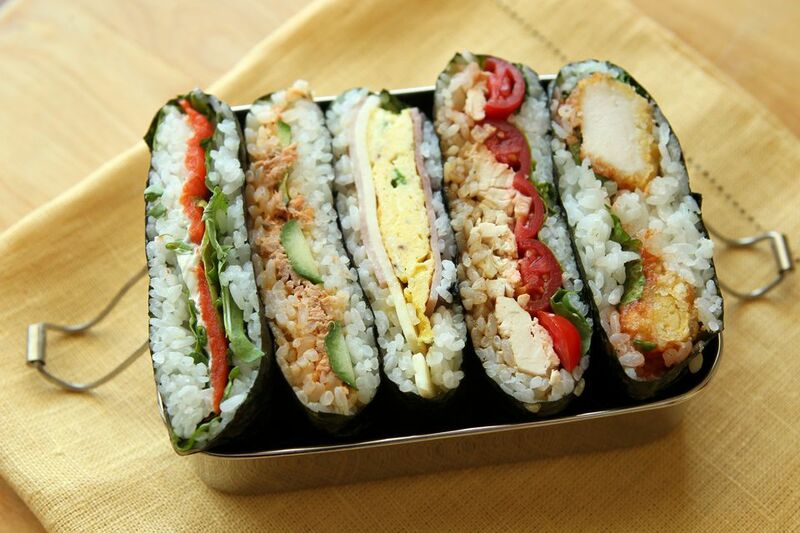 Essentially, onigirazu may be thought of as a hybrid Japanese rice ball sandwich. Interestingly, onigirazu first appeared in Japanese culture in 1990 in none other than a very popular comic book series known as "Cooking Papa." The main character of the comic series is a salaryman (a Japanese term for a white-collar businessman employed by a corporation on a traditional salary) who is secretly a very good cook and enjoys cooking for himself and his family. The big secret is that he doesn’t want anyone, especially his co-workers, to know that his wife is unable to prepare anything worthwhile and that he is, in fact, the cook of their family and of all of the delicious bento lunches that he takes to work. He lies and tells everyone that his wife is an amazing cook. In one chapter of this comic book series, Papa invents onigirazu, which, is his version, takes less than 5 minutes to prepare. He basically spreads cooked rice on a large piece of dried seaweed, or nori, then proceeds to pile on various non-traditional rice ball fillings, then quickly folds his onigirazu closed, cuts them in half, and the result is two halves that look like an onigiri sandwich. The name onigirazu is quite interesting and is a term that was derived from both the word onigiri (English translation: rice ball) which means to nigiru, or to mold (rice) in one’s hands, and nigirazu, where razu means the opposite, to not mold in one’s hands. Essentially, onigirazu means a rice ball that does not need to be molded in one's hands. When do you eat onigirazu? Onigirazu may be enjoyed almost any time of the day. It can be eaten for breakfast, or as a snack, but it is most popularly enjoyed at lunch. Onigirazu is especially popular when included as part of a bento meal.